My weekend started with a bottle of red wine, shared on the couch with my honey, and ended with…well, the same thing, come to think of it. Steve and I both love relaxing at home, but lately our timing hasn’t been exactly in sync. He’s working about six and a half days a week on big projects, so when he’s home, he is generally ready for a nap, a cuddle, and some Food Network or football. I, on the other hand, work alone all day, so while my pace is about as hectic as Steve’s, I deal mostly with vegetables, lentils, a camera, and a computer screen. Not surprisingly, the scarcity of human interaction leaves me itching to get out and about. When I worked in an office, the incessant banter, especially during football season, drove me nuts. I’m most productive in complete silence, or, better yet, with the sound of steady rain. Now I realize, as with most things that we label as “bad” when they’re happening, that two hour discussions about a single quarter of football or the newest restaurant in town (that I would never want to try), served their purpose in keeping mine and Steve’s desire for socialization–none, after a long week–in line with each other. It’s more challenging these days. After that first bottle of wine on Friday night, we had opposing desires on how the night should progress–with delivery of Indian food, or a walk to the restaurant, requiring a switch from PJs to real pants at the late hour of 8:30 PM. “Have you left the house today?” Despite my resistance to the idea of jeans, someone knew that I had been cranking out photos, blog posts, and two versions of broccoli cheddar rice bake all day, and this time he would compromise to make sure I don’t go insane and stir crazy. More work ensued for us over the course of the weekend, but we had a lot of time to relax together and sort of realign our socialization needs. Saturday Steve again sacrificed his slightly tired self so we could head into NYC a little before we were due for the Allman Brothers Band show at the Beacon Theatre. We discovered a nice little spot on the upper West side, Vanguard Wine Bar, where we sat at the bar with exposure, through a wide open storefront, to the warm-ish evening. Not exactly a great view beneath some scaffolding, but the well curated wine list, friendly bartender, quiet crowd, and some salty marcona almonds (Ina’s favorite, therefore my favorite) made up for it. 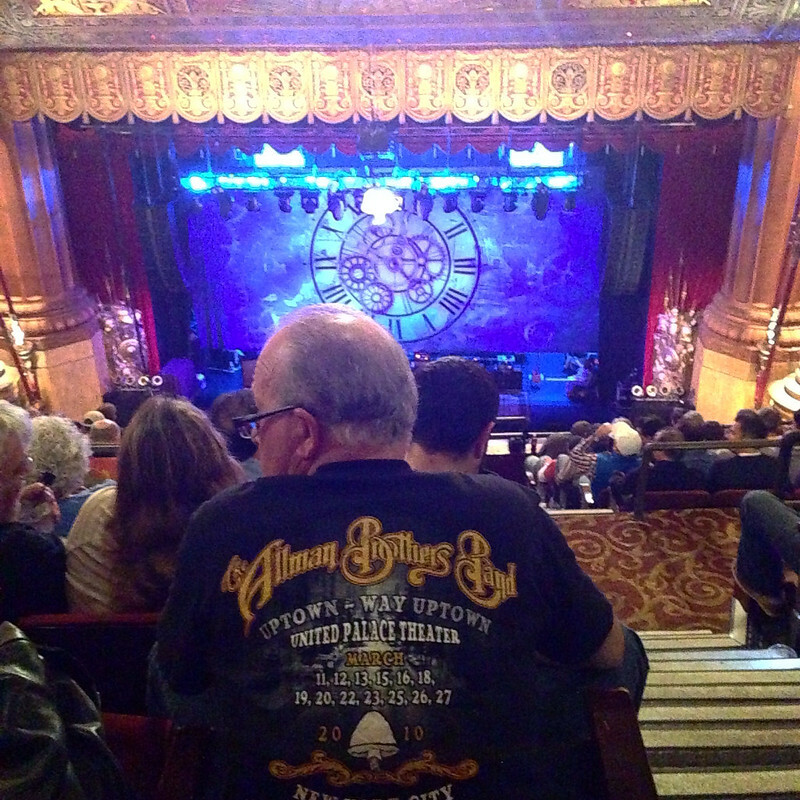 My second and last ABB show (two for me, sixty-some for Steve) was just shy of the thrill of the first, lacking only in a guest performance by Susan Tedeschi. I got spoiled at my first show, I guess. Steve was rewarded after an early Sunday morning of work in NYC with another sunny day, a walk to the diner, and a bordering-on-hibernation length nap. Oh, and the diner. That would be the chocolate chip pancakes you saw on Instagram yesterday. 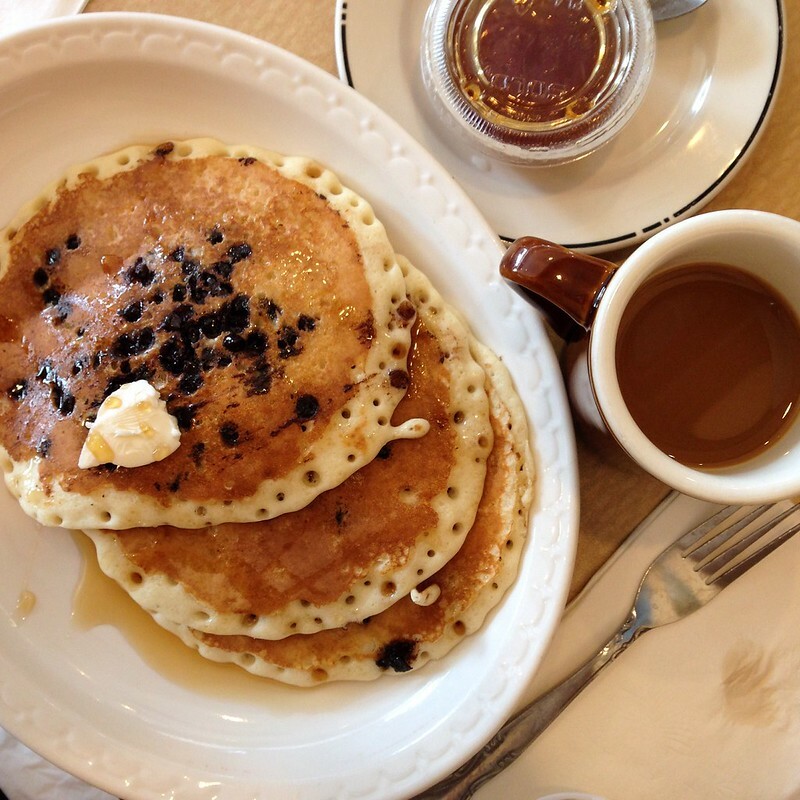 I woke up wanting nothing but to immerse myself in pancakes that someone else prepared, and a cup of coffee. It was everything I hoped for, of which I was reassured every time I sunk my teeth into a bite of those spongy sweet masterpieces soaked in salted butter and pure maple syrup (syrup that, I suppose, was well worth the $2.50 one must pay to avoid corn syrup-laden Aunt Jemimah). Another bottle of red, this time French, and dinner of leftovers from Friday night’s Indian food outing, ended the weekend much how it began, but this time the pajama pants won. When you cook for two, there tend to be a lot of leftovers. I’m sure you’re familiar with the scenario if you cook for a number of people below the standard four or more to which most recipes cater, mine included. Given the quantities in which we purchase ingredients and the difficulty of evenly cooking small quantities of food in most people’s family-sized cookware, writing recipes for a larger family is just easier. Constantly cooking this way for two people, though, results in leftovers galore and the weekly challenge of how to handle them while exploring new recipes. Just yesterday afternoon I said I wasn’t going to have to cook at all this week, but then I’m led to creating even more leftovers by planning recipes (and hence, cooking) to use up the pound of butternut squash and half a head of red cabbage from last week, and I haven’t even addressed two quarts of leftover soup or that pan (um, two pans) of broccoli cheddar rice bake. So, instead of creating a wild rice and butternut squash frittata which will use up those fresh ingredients but leave us with half the frittata to add to the freezer stockpile, I’m using fresh produce leftovers in recipes that truly yield only two portions, and I’ll freeze the soup and casserole for much later in the week or even the week following. It takes some thought and time to plan, but to me, it’s worth it if nothing goes to waste. 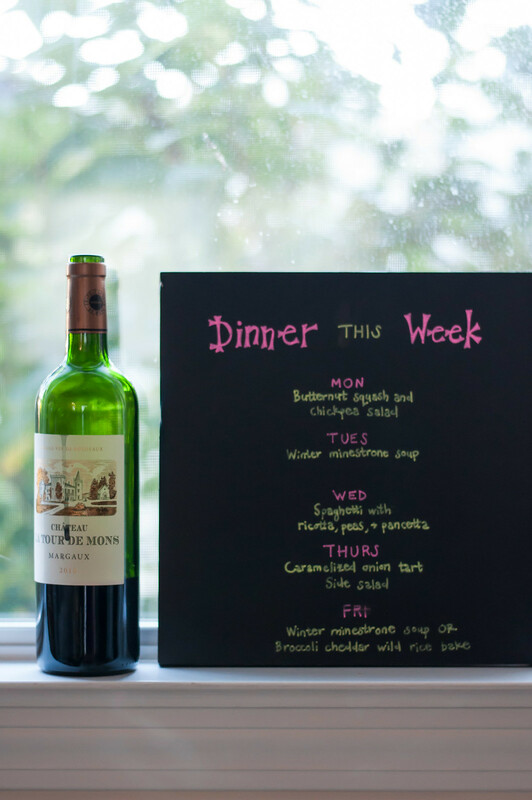 Simple recipes for two this week will require a little preparation, but probably no more than a half hour per night. Annoying as they may be, all those BuzzFeed “10 Things to Make Using __________”-type articles are all over the internet for ingredients as simple as milk. I pulled inspiration from more than one of those articles this week (see my Pinterest boards for the articles that I found worthy of saving), even discovering that I can freeze that leftover milk for later baking adventures or a cheese sauce, instead of forcing myself to use it in the next three days or, worse, trashing it. We’re lucky enough not to have to worry much about grocery bills, but both Steve and I were raised to value frugality, and throwing away food will always feel to me like throwing cash in the garbage can, not to mention discarding something that so many families struggle to afford. I see it as critical to take responsibility for using as much as I possibly can of what we purchase. Here’s the dinner plan I came up with using the tactics above. I don’t share my lunches here, but I eat at home nearly every day, utilizing even more leftover dishes and ingredients, especially small amounts of fresh vegetables that are about to “expire”. 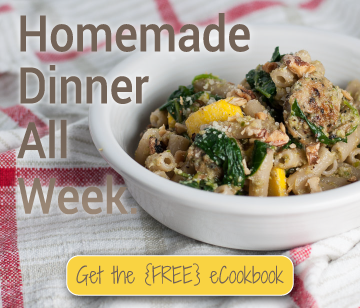 A lot of past weekly menus include recipes in development that I’ve since published on the site. I’ll go back and update them with links when the recipe is published, so you can get even more practical ideas by perusing the archives. 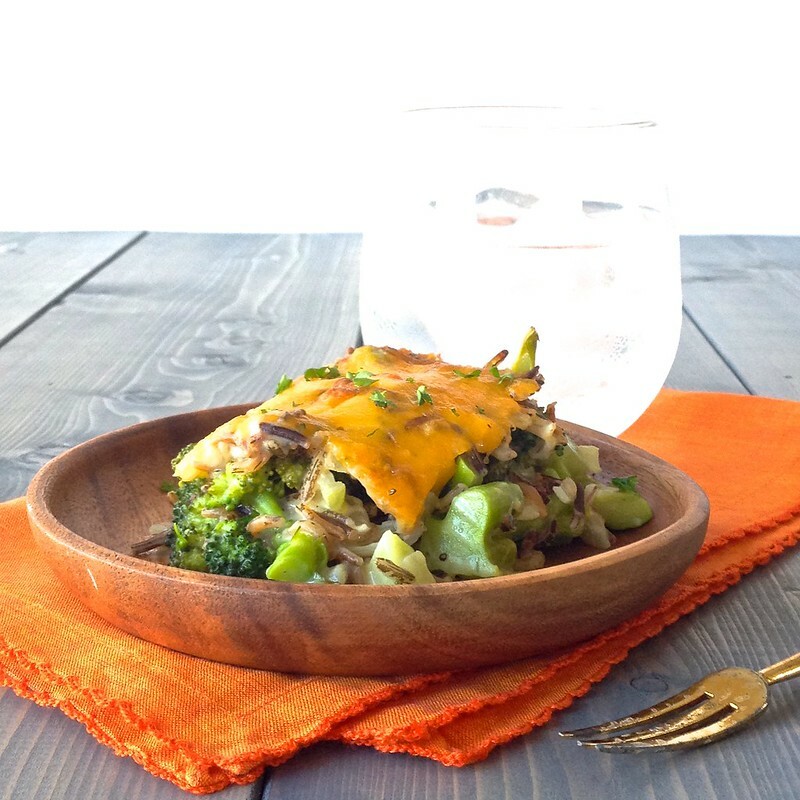 Watch for the broccoli cheddar rice bake recipe this week. Have a refreshed Monday, take some you-time/family time, and let me know what you eat this week!